It was entirely too hot to go anywhere today, we made it a few blocks away, but it was even verging on too hot. We frequently overlook Asia Dog, but it's nice to have them around. Quick, easy and fun. Their yam fries with kimchi aioli is a must if you go. 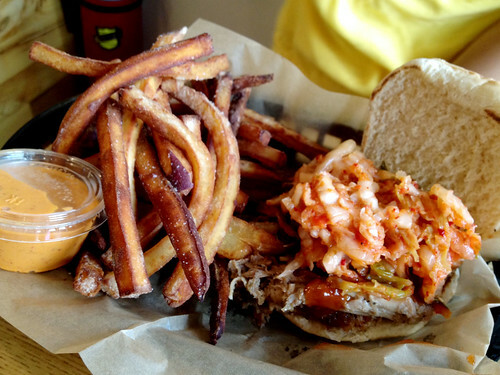 Y tried the pulled pork sammy w/ ginger bbq (pictured) and me the bbq bulgogi burger. Both quite tasty if not a little on the sweet side. Their hotdogs might be a little more interesting but there's all worth a try.